Polluted urban pollution damages the health of the population in all countries of the world. According to the World Health Organization (WHO), only two percent of urban residents live in an environment with an acceptable amount of small dust particles. The measures that can reduce pollution, it is not only the movement of dirty operations, reduce automobile traffic and more efficient public travel, but also to promote cycling. This was stated by the participants at the conference Green Week, which took place last week in Brussels. In 1950 lived in towns third of the world's population, currently it is more than half, and if this trend continues, it will be by 2050 two-thirds. Especially in Asia and other developing countries, while the urban sprawl and pollution significantly increases the air. It is particularly in China, where the World Bank is now 16 out of 20 cities with the most polluted air. According to the World Health Organization is polluted urban air culprit about 1.3 million premature deaths each year. By 2050, while the number could rise to 3.6 million, with the largest proportion of deaths attributable to China and India. "Huge problems we had, we in Mexico City," said Martha Delgado at the conference Peraltaová, which was in the capital Mexico City in charge of the environment. According to her, not at the beginning or very difficult to convince the public that the air pollution need to do something. "On the street just slumped dead birds, children and old people suffered major health problems," said Peraltová. 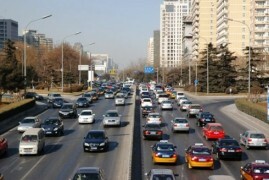 The city is gradually came up with a number of measures to help reduce pollution. One day a week as people were not allowed to drive out to your car (know it by registration). Later, the city began to measure emissions from cars and traffic those with excessive fumes was even more limited. Refineries and certain other industrial operations had to move out of town. Substantial improvements have received public transport and the city was also introduced bicycle sharing system. "It took us 20 years to get it really improved," said Peraltaová. In 1990, Mexico City experienced only eight days with good air quality, now it's over 230 days. "Our goal is to achieve a good quality but the atmosphere every day of the year." Presentation of the situation in China, which took Yu Lei of the Chinese Academy for Environmental Planning and Zhou KCHEM of Renminské University in Beijing, talked somewhat less optimistic. According to them, especially eastern China at present is apparently the worst air quality in the world. The central government said it has established limits for some pollutants, but it is far from enough. The problem is that cities are growing very quickly due to the peasants from rural areas who have to move for work. Any help would be according to the Chinese representatives to planning that would prevent a further increase in the largest population agglomerations and directed to middle and small cities. A fundamental change, however, according to Yu raining could only bring industrial restructuring. "Today, we are a manufactory of the world, perhaps half the world's steel is produced in China. He helped the transition to a more sophisticated, more hi-tech products, "said Yu Lei. "Our advantage could be relatively strong central government," said the debate Yu Lei. During the 2008 Olympics in Beijing and the Expo 2010 in Shanghai is the government measures showed that pollution can be cut. The biggest polluters have to reduce or close down their operations, some of them even forever. Was also limited transportation and burning of coal in Shanghai and shipping industry at sea. The Chinese authorities, however, do not want to reach a broader drastic measures for fear of unemployment. Chinese city yet experienced an interesting paradox. While twenty years ago were typical picture of the Chinese city of disorganized hordes of cyclists, in recent years this has changed. People shifted to cars and China is now racking their brains as to return to the wheel. "How to increase, people have to travel long distances, and that's the bike not zvládnot," said Yu Lei. Deputy Mexico City but stressed that it was cycling should not be underestimated and that can accomplish a lot in big cities. "People can commute by bike needed to metro station or other means of public transport. We support a lot of cycling proved, "said Peraltaová. Her words confirmed Javier Maroto Aranzabal, the mayor of the Spanish town of Vitoria-Gasteiz, which became the European Green Capital for 2012. "Cycling is important to us. Over the last ten years, our increased number of rounds seven times. And I ride to work every day on the bike, "said the mayor of the city with approximately a quarter-million people." It's faster, safer and cheaper. "